This is the first book in the Jewels of the Ton Series. When You Give a Duke A Diamond is a nice Historical Romance that has some twists and turns. Its entertaining and a real page turner. The characters must deal with murder, mystery and conflict. We meet Juliet and William. They must work together in this story to keep Juliet from danger after she witnesses a brutal incident. The friction between them brings out their true selves and a connection that they both needed. This book is a great start to a series that I'm sure will be amazing. 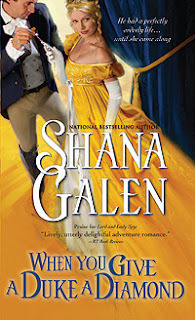 4 stars to Shana Galen. Can't wait for the rest!